The applicant, Mr Eynulla Fatullayev, is an Azerbaijani national who was born in 1976 and lives in Baku. He is represented before the Court by Mr I. Ashurov, a lawyer practising in Baku. The applicant was the founder and chief editor of the newspapers Realny Azerbaijan (“Реальный Азербайджан”), published in the Russian language, and Gündəlik Azərbaycan, published in the Azerbaijani language. The newspapers were widely known for often publishing articles harshly criticising the Government and various public officials. Prior to the events complained of in this application, on 26 September 2006 the applicant had already been convicted for defamation and conditionally sentenced to two years’ imprisonment. He had also been sued for defamation in a number of civil proceedings. In 2007 two sets of criminal proceedings were brought against the applicant in connection with, inter alia, two articles published by him in Realny Azerbaijan. In 2005 the applicant visited, as a journalist, the area of Nagorno-Karabakh and other territories controlled by the Armenian forces. There he met with, among others, some officials of the self-proclaimed unrecognised “Nagorno-Karabakh Republic”. In the aftermath of this visit, in April 2005 the applicant published an article called “Karabakh Diary” (Russian: “Карабахский дневник”) in Realny Azerbaijan. In his submissions to the court, the applicant argued that the forum postings at the AzeriTriColor website had not been written by him and denied making these statements. He also argued that, in “Karabakh Diary”, he had merely written about the information given to him by persons that he had interviewed. On 6 April 2007 the Yasamal District Court, presided by Judge I. Ismayilov, upheld Ms Chaladze’s claim and ordered the applicant to pay compensation in the amount of 20,000 New Azerbaijani manats (approximately 16,000 euros). Thereafter, a group of former soldiers and other persons who had been involved in the Khojaly events, represented by Ms Chaladze, filed a criminal complaint against the applicant with the Yasamal District Court, under the procedure of private prosecution. They asked that the applicant be convicted for defamation and false accusation of Azerbaijani soldiers of having committed an especially grave crime. At a preliminary hearing held on 9 April 2007, the applicant filed an objection against the entire composition of the Yasamal District Court. He claimed that all of the judges of this court had been appointed to their positions in September 2000 for a fixed five-year term and that their term of office had expired in 2005. He therefore argued that such a composition of the court could not be considered as a “tribunal established by law”. This objection was dismissed. The hearing of the criminal case took place on 20 April 2007 and was presided over by Judge I. Ismayilov. In his oral submissions to the court, the applicant pleaded his innocence. In particular, he denied making the statements on the forum of the AzeriTriColor website and maintained that those statements had been made by someone else who had used his name for this purpose. The court heard a linguistic expert, who gave an opinion on the applicant’s statements, and a number of witnesses, who testified about the Khojaly events. The court also found that the internet forum of the AzeriTriColor website, in essence, replaced the internet forum of the Realny Azerbaijan website, which had become defunct in 2006, and that the statements posted on that forum under the screen name “Eynulla Fatullayev” had indeed been made by the applicant himself. Lastly, the court found that, through his statements made in “Karabakh Diary” and his internet forum postings, the applicant had given a heavily distorted account of the historical events in Khojaly and had deliberately disseminated false information which damaged the reputation of the plaintiffs and accused them of committing grave crimes which they had not committed. The court convicted the applicant under Articles 147.1 (defamation) and 147.2 (defamation by way of accusing a person of having committed a grave crime) of the Criminal Code and sentenced him to two years and six months’ imprisonment. The applicant was arrested in the courtroom and taken to the Investigative Isolator No. 1 on the same day (20 April 2007). Until 23 April 2007, his lawyer was not allowed to visit him as he was required to obtain a court’s permission to do so. On 6 June 2007 the Court of Appeal upheld the Yasamal District Court’s judgment of 20 April 2007. On 21 August 2007 the Supreme Court dismissed the applicant’s cassation appeal and upheld the lower courts’ judgments. In the meantime, on 30 March 2007, Realny Azerbaijan published an article called “The Aliyevs Go to War” (Russian: “Алиевы идут на войну”). The article was written by the applicant but published under the pseudonym “Rovshan Bagirov”. This analytical article was devoted to possible consequences of Azerbaijan’s support of a recent “anti-Iranian” resolution of the UN Security Council, which had called for economic sanctions against that country. The article referred to the current Azerbaijani government as “the Aliyev clan” and “the governing tribe” and expressed a view that the latter sought US support of President Ilham Aliyev’s “remaining in power” in Azerbaijan in exchange for Azerbaijan’s support of the US “aggression” against Iran. The article continued with a long and detailed list of such targets, which included, inter alia, active oil platforms on the shelf of the Caspian Sea, the Sangachal Oil Terminal and other oil plants and terminals, the Baku-Tbilisi-Ceyhan oil pipeline and the Baku-Tbilisi-Erzurum gas pipeline, the building of the Presidential Administration, the building of the US Embassy in Azerbaijan, buildings of various ministries, the Baku seaport and airport, a number of large business centres accommodating offices of major foreign companies doing business in Azerbaijan, etc. On 16 May 2007 the investigation department of the Ministry of National Security (“the MNS”) commenced a criminal investigation in connection with this publication under Article 214.1 of the Criminal Code (terrorism or threat of terrorism). On 22 May 2007 the investigation authorities conducted searches in the applicant’s apartment and in the office of the Realny Azerbaijan and Gündəlik Azərbaycan newspapers. They found and seized certain photographs and computer discs from the applicant’s apartment and twenty computer hard drives from the newspaper’s office. On 26 May 2007, pursuant to a decision of the Sabail District Court, the applicant was transferred to the MNS detention facility. On 31 May 2007 the Chief Prosecutor made a statement to the press, noting that the article published in Realny Azerbaijan, founded by the applicant, contained information which constituted a threat of terrorism and that a criminal investigation had been instituted in this connection by the MNS. On 3 July 2007, by a decision of an MNS investigator, the applicant was formally charged with committing the crimes of threat of terrorism (Article 214.1 of the Criminal Code) and inciting ethnic hostility (Article 283.2.2 of the Criminal Code). “Eynulla Emin oglu Fatullayev, if he remains at large, may escape the investigation and trial and hinder the determination of the objective truth in [this criminal] case. The applicant appealed. On 11 July 2007 the Court of Appeal upheld the Sabail District Court’s decision. On 4 September 2007 the applicant was also charged with tax evasion under Article 213.2 of the Criminal Code due to the alleged failure to duly declare taxes on his personal earnings as a newspaper editor. During the trial, among other evidence, the prosecution produced evidence showing that in May 2007 the full electronic version of “The Aliyevs Go to War” had been forwarded by e-mail to offices of a number of foreign and local companies in Baku. A number of employees of these companies testified that, after reading the article, they had felt disturbed, anxious and frightened. On 30 October 2007 the Assize Court found the applicant guilty on all charges and convicted him of threat of terrorism (eight years’ imprisonment), inciting ethnic hostility (three years’ imprisonment) and tax evasion (four months’ imprisonment). Partial merger of these sentences resulted in a sentence of eight years and four months’ imprisonment. Lastly, the court partially merged this sentence with the applicant’s sentence of two years and six months’ imprisonment imposed on him in the previous criminal case, which resulted in a total sentence of eight years and six months’ imprisonment. On 16 January 2008 the Court of Appeal upheld the Assize Court’s judgment of 30 October 2007. On 3 June 2008 the Supreme Court upheld the lower courts’ judgments. 1. The applicant complained under Article 3 of the Convention about the conditions of his detention in the Investigative Isolator No. 1 and the MNS detention facility. In particular, he complained that he had not been allowed to receive newspapers and magazines, had been handcuffed and searched every time when taken out of his cell, had not been allowed personal visits, and had been held in a single cell of 8 square meters which had been badly ventilated and in which the electric light had been switched on throughout the day and night. 2. The applicant complained under Article 5 §§ 1 (c), 3 and 4 of the Convention about the detention order of 3 July 2007. In particular, he complained that there had been no reasonable suspicion that he had committed a crime and that the domestic courts had failed to give sufficient reasons for his detention on remand. (c) that he had been deprived of his right to have a fair determination of the criminal charges against him and right to an effective domestic remedy. 4. The applicant complained under Article 6 § 2 of the Convention that his presumption of innocence had been violated by the fact that on 31 May 2007, before the trial in the second criminal case, the Chief Prosecutor had made a public statement accusing him of having committed a serious crime, as well as by the fact that, during the trial, he had always been brought to the courtroom in handcuffs and placed in a metal cage during the hearings. 5. The applicant complained under Article 6 § 3 of the Convention that, despite having been transferred to the MNS detention facility on 26 May 2008 due to investigation-related reasons in the second set of criminal proceedings, he had not been informed of the nature and cause of the accusation against him until 3 July 2008. 6. The applicant complained under Article 7 of the Convention that the acts for which he had been convicted did not constitute a criminal offence. 7. The applicant complained under Article 8 of the Convention that the searched conducted on 22 May 2007 in his apartment and the newspaper’s office had violated his right to respect for his home. 8. The applicant complained under Article 10 of the Convention that his convictions in both sets of criminal proceedings had violated his right to freedom of expression. (a) Could the court which heard the applicant’s first criminal case be considered as a “tribunal established by law”, as required by Article 6 § 1 of the Convention? Had the term of office of the presiding judge expired before the trial commenced and, if so, did he have competence to participate in the trial? (b) Was the court which dealt with the applicant’s first case independent and impartial, as required by Article 6 § 1 of the Convention, given that the applicant’s criminal trial was presided over by the same judge who had previously examined the civil claim against the applicant relating to the same subject matter? 2. Was the presumption of innocence, guaranteed by Article 6 § 2 of the Convention, respected in the present case? In particular, was the Chief Prosecutor bound to respect the presumption of innocence when making his statement to the press on 31 May 2007? 3. In connection with each of the applicant’s criminal convictions, has there been an interference with the applicant’s freedom of expression, in particular his right to impart information and ideas, within the meaning of Article 10 § 1 of the Convention? If so, was that interference necessary in terms of Article 10 § 2? 4. The parties are requested to submit, inter alia: (a) a full copy of the applicant’s article entitled “Karabakh Diary”, as published in Realny Azerbaijan; (b) a copy of the Yasamal District Court’s judgment of 6 April 2007 concerning the civil claim against the applicant; (c) copies of all the evidence, as contained in the case file of the criminal proceedings, which was examined by the Yasamal District Court during the trial for the purpose of establishing the applicant’s authorship of statements posted on the forum of the AzeriTriColor website; and (d) copies of all appeals and any objections filed by the applicant during both criminal trials, including a copy of his objection to the participation of the judges of the Yasamal District Court in the first set of criminal proceedings. The BBC reports on a skirmish in the indigenous Armenian enclave of Nagorno-Karabakh, a de jureregion of Azerbaijan, that has left at least two Azeri soldiers dead after the latter, according to the Armenian side as reported by the Associated Press, captured an Armenian post and were soon kicked out. Whatever the case, there is no independent Azeri sources to read about the news – one of them, www.realazer.net being terminated and its editor sentenced to over ten years in jail, and most Armenian news websites still limited to providing official government information due to the temporary state of emergency. Nonetheless, Day.az from Azerbaijan reports in Russian in its latest updateon the fight that Azeri authorities state they have “eliminated” 12 Armenian soldiers while only three Azeri soldiers became “martyrs.” The website of Armenia’s Foreign Ministry quotes Cabinet Minister Vartan Oskanyan as saying, “There are casualties. As of this moment, there is one injured from the Armenian side, and as the Azerbaijani press reported, two deaths from their side, and injuries too. These we can obviously not confirm.” Some Azeri users of a Day.az’s Russian-language Forum have suggested that Armenians may in fact have more casualties. Oskanyan, they suggest, may not release the information given the recent violent protests in the country. Eurasianet has a story on Azerbaijan’s arrogant war rhetoric and Armenia’s response. EU officials touring the South Caucasus this week were confronted by heated words from President Ilham Aliyev, who told them Azerbaijan is ready to “wage war” with neighboring Armenia over the disputed territory of Nagorno-Karabakh. Azerbaijan’s recent windfall of oil and gas revenues appears to have persuaded Aliyev that he could turn the tables on Armenia, which has long held the military upper hand in the dispute over Nagorno-Karabakh, a predominantly ethnic-Armenian territory located within Azerbaijan. In talks on February 4 with Slovenian Foreign Minister Dmitrij Rupel, who was representing the current EU Presidency, Aliyev indicated Baku was contemplating waging war for control of the disputed territory, which together with a strip of adjacent Azerbaijani territory has been under Yerevan’s control since a 1988-94 war between the two countries. Benita Ferrero-Waldner, the EU’s external relations commissioner, tells RFE/RL that Brussels firmly rejected Baku’s “inflammatory” rhetoric. “I clearly said, not only to the authorities, but also at the press conference, that I think it is highly important that they avoid any inflammatory speech at the moment of presidential elections,” she says. Both countries are holding a presidential vote this year — Armenia on February 19, and Azerbaijan in October. The Organization for Security and Cooperation in Europe (OSCE), which has spent more than 15 years mediating talks between the two sides, has indicated an election year is not likely to see major progress on the issue. Baku, however, appears impatient. The Azerbaijani leadership, Rupel said, appears to feel that “time is not on Armenia’s side.” Nor is money. Azerbaijan’s defense budget this year will exceed $1 billion; Armenia’s is just one-third of that figure. Azerbaijan has enjoyed spectacular economic growth over the past few years. The country’s GDP grew by 25 percent in 2007, almost exclusively on the strength of oil and gas exports. Azerbaijan’s minister for economic development, Heydar Babayev, says he expects his government to generate upward of $150 billion in oil and gas revenues by 2015. Armenia, meanwhile, has no lucrative natural resources. It is landlocked, blockaded by neighbors Turkey and Azerbaijan, and — at Baku’s behest — bypassed by oil and gas pipelines, as well as rail and road projects, which originate in Azerbaijan. But, as Rupel notes, Armenia has “alliances that speak for it.” This is a reference to Russian backing. Throughout the Nagorno-Karabakh conflict, Russia is rumored to have given Armenia military equipment worth $1 billion. Russia provides for most of Armenia’s energy needs and has bought up most of its energy infrastructure. The Armenian government did not appeared cowed by Baku’s fighting words. Foreign Minister Vartan Oskanian tells RFE/RL that Armenia is confident of its military capability. “No matter how strong the Azeris will be in the next 15 years, even with this kind of spending, even [if it] doubled every year, to catch up with Armenia’s commitment to defend itself and Karabakh, that will require [as a] minimum 15-20 years,” he says. 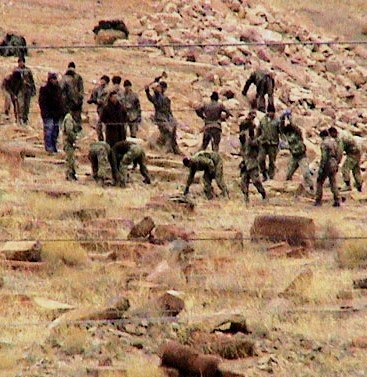 Over a year and a half after Azerbaijan smashed to dust the largest medieval Armenian cemetery in the world (see “Djulfa” at the top of this blog), the Azeri authorities are preventing again European observers from visiting the site where the cemetery existed. postponed again, Milli Majlis press service told APA. Karabakh and the other territories occupied by Armenia. to Nagorno Karabakh through Armenia (by car from Yerevan). community and international organizations like UN, OSCE, NATO, CE etc. change its firm position in any condition. stance and postponed the visit. Now, how technically possible it is for European observers to visit Nagorno Karabakh from Azerbaijan is only for the pious Azerbaijani officials to figure out. What is Azerbaijan’s response to the fact that its own Ambassador to Russia visit Nagorno Karabakh, and logically through Armenia, in June of this year? Of course the one and only logic behind any of the illogical Azerbaijani attempts to stop the monitoring of cultural rights in both Armenia and Azerbaijan is because they know they have smashed Djulfa to dust and can’t cover it up. For one reason they know there are satellite images, that are as objective as anything else can get in the world, that show the cemetery before the destruction. For another reason, they can’t admit that they committed an act of cultural vandalism, or cultural genocide, against a people they consider the creators of all evil on Earth. And most badly, they have lied so many times on the destruction of Djulfa that accepting they lied would undermine their very authority. Anyhow, although I have been in touch with Mr. O’Hara (the head of the delegation who was supposed to visit and of course never will) and although he doesn’t sound interested in the faith (well, I guest in the past a lot) of Djulfa, I still believe it is to much extent the fault of Armenians that the world doesn’t know about the silenced story of Djulfa. Well, I should go back to my homework. That’s the best I can do for Djulfa at this minute. But of course there is a reason I have not been really active on the blog recently. So yeah, Azerbaijan, I don’t know about the rest of my kin, but I have not forgotten Djulfa and never will.